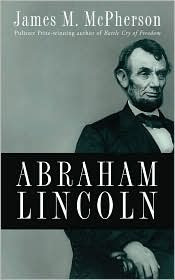 The book of the week was Abraham Lincoln by James M. McPherson. I thought I would do something different this week and read a biography. My intention was to read it and find an aspect from that leader's life and write about incorporating it into your life. Turns out this idea didn't quite pan out the way I intended. What I can tell you is Lincoln was a pretty great guy. He was honest and intelligent. He had a number of great speeches and his Emancipation Proclamation was vital for America to be the great country it is today. The problem with pulling out ideas from Lincoln's history to use in today's business world, is that the world is a different place. I feel it is much more difficult to differentiate yourself in today's world than it was back then. No longer does a college degree assure you a great job and a nice salary. Being the smartest person in the room no longer means you will be the most successful. In fact, a gaggle of the richest men in the world are college dropouts. After realizing the large differences that face our two worlds, I decided that I would like to talk about one aspect of Lincoln's leadership that is absolutely transferable into leadership today: The ability to control emotions. To have control over one's emotions has an incredible effect. If you wear your emotions on your sleeve the people working with you will never want to give you 'bad' news. However, if you have the same demeanor when you are upset as when you are mad then it will be very easy to have open communications with you. It is extremely difficult to master the art of controlling your emotions... There are a couple ways to do this. I'll give you my method, as well as, Lincoln's. My extremely simple approach to not losing my cool is to have a 'big picture perspective' all the time. Having a big picture perspective is just what is sounds like... I look at everyday from a 2-3 month perspective. I handle all things in the present, but when 'bad news' comes I always put it in a 2-3 month perspective. So I ask myself if this bad news will be anything I will still be concerned with in 2-3 months, or is it even something I'll remember hearing. More often than not, any bad news you'll receive is inconsequential in the big scheme of things. I feel there is no reason to get stressed or make someone feel bad for something that doesn't have that big of an affect. People make mistakes every day, and usually they learn from them. If you lose your temper every time you hear about a mistake, no one will learn anything. From the first day you are with any organization be a Rock. Encourage the professional development of every person within your organization. Make sure that when the day comes that you have to leave that organization, you can look back and see the impact you've made. Because if you don't encourage that development and make your people better, the organization won't evolve, and neither will you. And organization must evolve to keep up. Don't be a caveman. Lincoln was just like anyone else, he got mad. But no one could ever tell he was mad. This was because Lincoln would write "hot letters"- they were just angry letters with how he felt and then he would put them into his drawer and never send them. It was his was of taking all the anger and getting it out of his system. Whatever system you use, just make sure you aren't that volcano of emotions within an organization. Be remembered for the right things.... helping people grow professionally and helping an organization evolve. This book was pretty good. I know a whole lot about Lincoln now and it was written very well. Typically biographies aren't my thing, but I wasn't disappointed. As always, if you have any questions on the book don't hesitate to ask. I would be more than happy to help anyone that wants it.